The CoffeeShop Blog: CoffeeShop Chalkboards 3 Set of Vintage Tags! CoffeeShop Chalkboards 3 Set of Vintage Tags! Today I wanted to post some more free chalkboard digital vintage tags. These are high resolution pngs and you can use them digitally or printed as frames or tags on storyboards, websites/blogs, cards, etc. I made these using my own shapes and some lovely graphics from The Graphics Fairy. I also wanted to point out this fun Letterpress tutorial and a link to really nice free textures! I love when I find more free resources I can share with you guys!!! 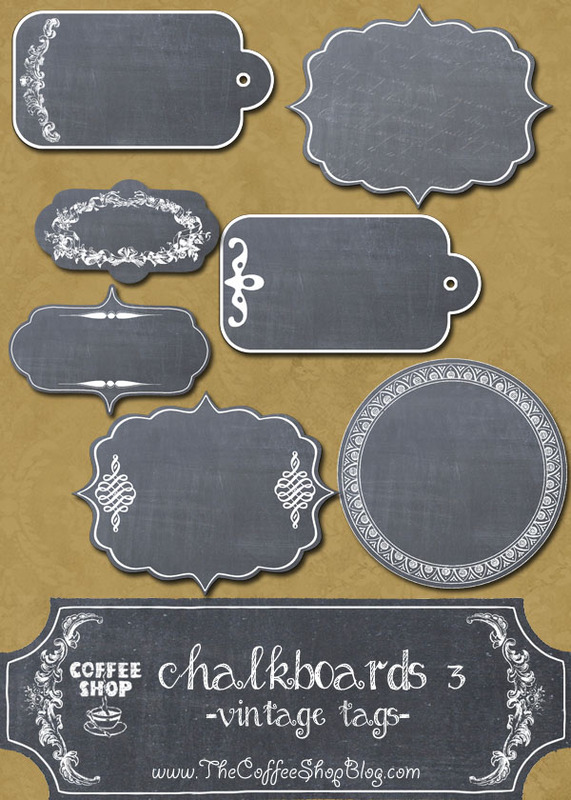 Download the free CoffeeShop Chalkboards 3 Set of Vintage Tags. You can also download them here. Oooh more! These are so great, thank you!!!!!! Thank you for these great tags. Do you have a tutorial on how to make the fonts look like chalk? thanks for these fun chalkboard tags-so cool! I love these!! Thank you! Where did you get that font? It's so cute. Just wanted to thank you for these amazing tags. I absolutely love them! They look fabulous on my Christmas Card. Very grateful! Thank you! I love the set!